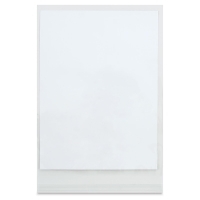 Protecting your artwork shouldn't be a time-consuming, cumbersome, and expensive process. Now it doesn't need to be! 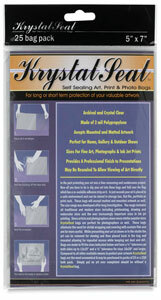 Simply slip your mounted or unmounted art into a Krystal Seal Bag, fold over the resealable flap, and you're ready to display or store your art in a print rack, flat file, portfolio, or storage box — while protecting it from dust, dirt, and fingerprints. 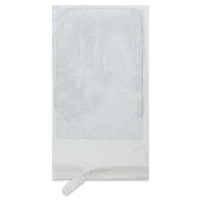 The crystal-clear, acid-free, archival bags are made of 2 mil polypropylene. Sizes measuring up to 13" × 19" (33 cm × 48 cm) have a ¼" (6.4 mm) tolerance on both sides. 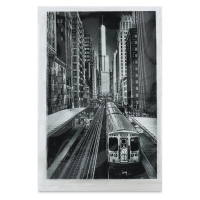 Sizes measuring 16" × 20" (41 cm × 51 cm) and larger have a ½" (13 mm) tolerance on both sides. 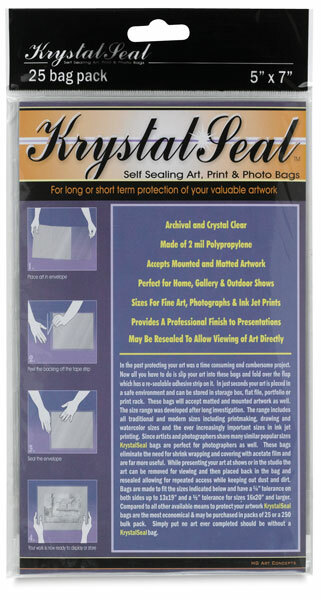 Krystal Seal Bags are available in many popular sizes for matted and mounted prints, drawings, watercolors, photographs, and inkjet prints — perfect for gallery, show, and studio use.